May 28 By Jen 86 Comments This post may contain affiliate links. 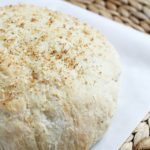 You will not believe how AMAZING this Peasant Bread recipe is! I got rave reviews every time I make it! 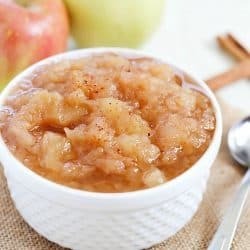 You know those recipes you have that you’ve been making for years and everyone in the family loves? This bread is one of those. I remember several years ago, I was invited to a friend’s home for lunch. It was a very casual lunch. I brought my kids, who played out back, while we sat down at my friend’s gorgeous dining room table to eat. It smelled beyond amazing in her house. She disappeared into her kitchen and came back out holding a tray with the most amazing loaves of peasant bread you’ve ever seen. Round circles of yeasty goodness. I’m honestly, practically salivating all over her nice table cloth at this point. She sets the tray down and I completely dive in. There’s this olive oil with garlic and seasonings that she’s warmed up for us to dip the bread in and my tastebuds go nuts. 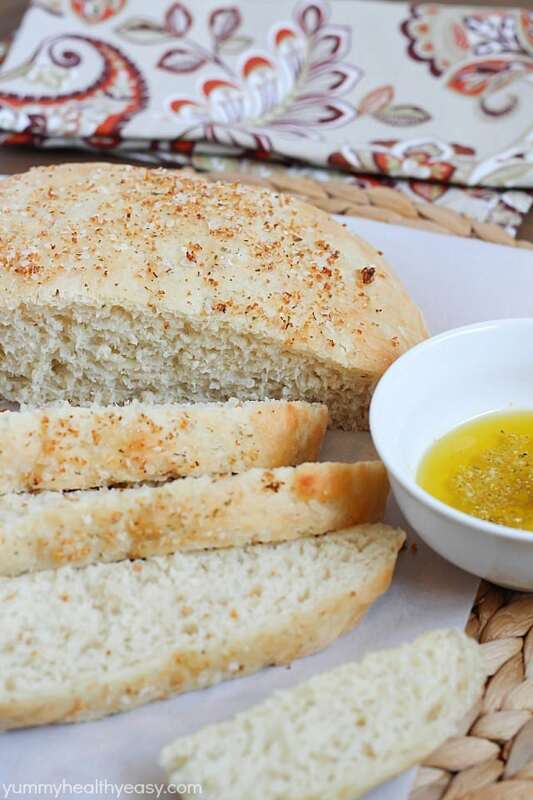 Ripping into the bread and dipping into the olive oil, I eat so much bread that I don’t have room for the main course! Oh yeah. She totally made that amazing, mouth-watering, delicious peasant bread. From scratch. You better believe I begged for the recipe! This peasant bread recipe is now one of our very, very favorite bread recipes in the history of all bread recipes. It’s so easy, you won’t even believe me when I show you the recipe. Only a few ingredients and no-kneading required. Boom. Perfect loaves of bread every. single. time. I made this the other day right before my boys came home from school. My oldest walked in and immediately recognized the amazing smell and said, “Mom! You made Peasant Bread!” Yep. It’s THAT good! I can’t wait for you to try it! A simple to make, no-knead recipe for the BEST bread ever! Mix yeast and warm water and let sit for 10 minutes. After 10 minutes, pour the yeast and water mixture in a mixing bowl with the sugar, salt and flour. Do not mix too long. Do not knead. Let rise until doubled. After rising, split into 2 rounds and place on greased cookie sheet. Let rise again until doubled. 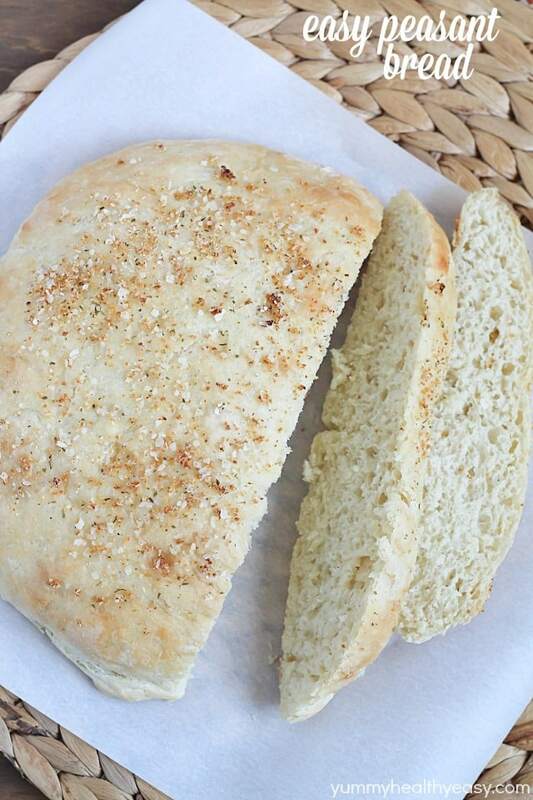 Preheat oven to 425º F.
Brush tops of bread rounds with egg white or melted butter and then sprinkle with garlic salt. Bake at 425º F for 10 minutes then reduce heat to 375º F and cook additional 15 minutes or until golden brown. We like tearing chunks off the rounds and dipping in olive oil and seasonings. So delicious! Enjoy! SPECIALLY Fresh and Homemade ! if i get my Oven Clean ( … when I moved in it was already very old_dirty … ) . THANK YOU , jen ! I’m SO HAPPY to hear this!! Thank you for taking the time to leave such a sweet comment! Glad you loved it as much as we do! Seriously dying over this right now- I soooo love bread. Especially like this. I would sit & eat this whole thing – in one sitting & not sharing. YUM-O!!! My yeast packet says it contains 2.5 teaspoons of yeast – just want to check that the total needed is really 2.5 tablespoons. 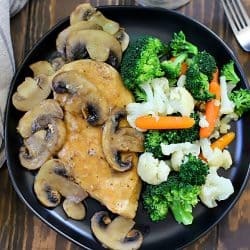 I have just one packet of yeast and would love to try this immediately; it sounds so good, but I don’t want to ruin it by using the wrong amount. Thanks. Oh boy, thanks for catching that Mary! I’ll change that, should be 2 1/4 teaspoons! I can’t WAIT for you to try it! Let me know how it turns out! Thanks, Jen. Can’t wait to make it. Easy breads are the best! I don’t have the patience to wait forever for a bread that won’t turn out. When I want homemade bread I mean business! This looks amazing, Jen! Can’t wait to try it! This seemed to turn out fine. Just took it out of the oven and smells great. However, after just ten minutes at 375 it was golden brown and sounded hollow when thumped. I was afraid to leave it in any longer for fear of it burning or drying out. How was the inside? Was it hollow or uncooked through? Have you ever tried to make this with gluten-free flour? I’m wondering if it would work just as well. Thanks! I haven’t, Christine but I just bought a brand new bag of gluten-free flour so I might just have to give it a try! Let me know if you try it gluten free and how it turns out for you. So did you make this receipt gluten free? Nope I haven’t yet. Sorry! I need to put it on my to-do list. I think it will turn out just fine if you use a gluten free all-purpose flour. 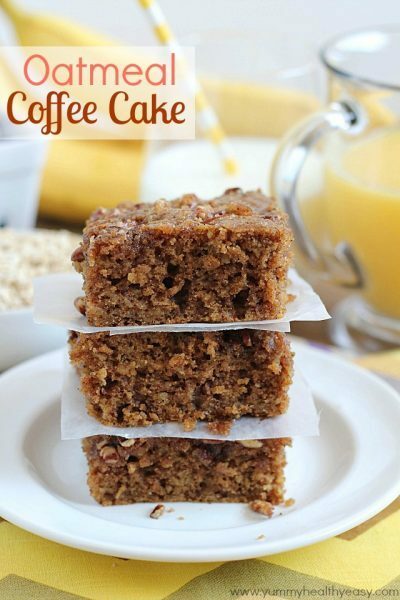 Can you make this with white whole wheat flour? I think so, Connie! 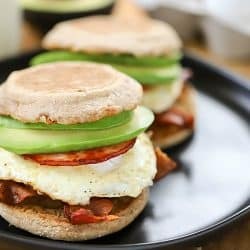 I haven’t tried it with white whole wheat flour, but I think it would work fine to sub. I always love/hate it when people tell me they made it. That means I can totally do this at home AND I can totally eat the whole thing at home too 😉 I live for the smell of homemade bread baking in the oven. 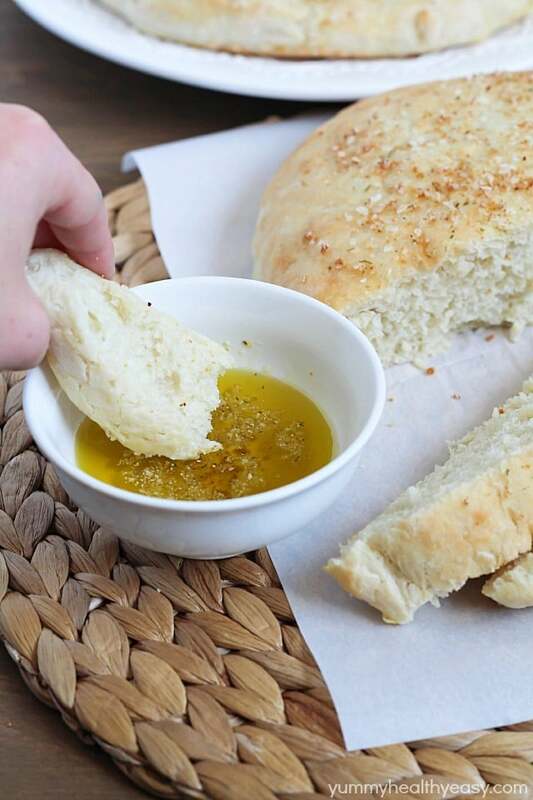 There are so many possibilities with this bread, but I think dipped in olive oil sounds the best! Pinned! That is one gorgeous loaf of bread! Can’t wait to try the recipe, Jen! Seriously, you will love it, Andi! 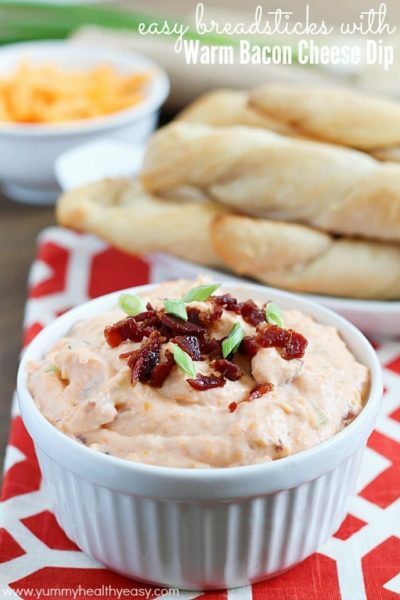 It would go perfectly with dinner on the nights when you and they hubs eat cheese, fruit & hummus! 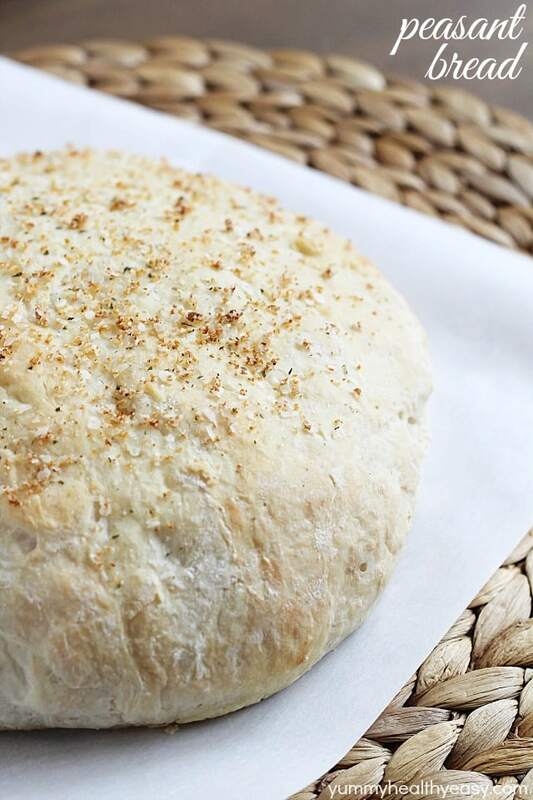 I love homemade bread – and I especially love easy fail-proof recipes! 🙂 pinning! Thanks for stopping by and for the pin, Jamie!! I hope you have a great weekend! This looks amazing ! 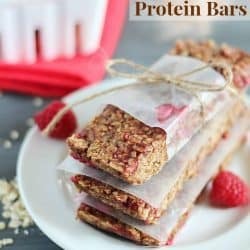 Would it be possible to use whole wheat flour for this ? Hi Allison! 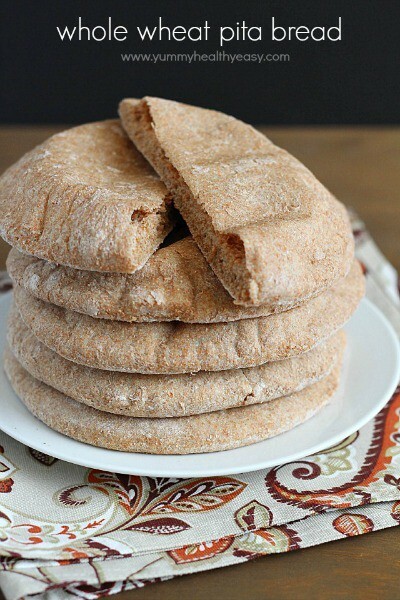 I’ve never tried this recipe using whole wheat flour but I imagine it should work just fine! If you do try it, let me know how you like it! I might give it a try soon myself! Tried this today and my dough was really sticky… is it supposed to be that way? The flavor was good but it was hard to work with. I live in the mountains so it may just be that I need to adjust the recipe some. Thanks! Hi Linda! It is a little sticky when you’re dealing with splitting the loaves, etc. 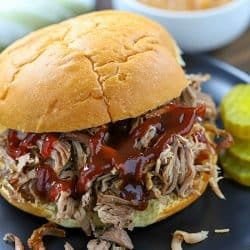 How was the texture after it was cooked? It could have been the elevation a little bit too. 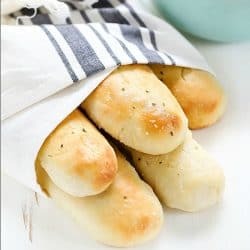 I have been dying to make my own bread but all the kneading and rising scared me off, but this looks simple so I’m definitely trying it, this may be a dumb question but what kind of flour do you use? Is it just all purpose flour? Also, can I mix it with the dough attachment in my food processor or do you just recommend by hand? 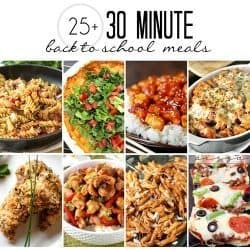 Can’t wait to hear from you so I can make this! Thanks so much for asking these questions! I was wondering the exact same thing. Hello! How long does this bread to take to make, from the mixing of the yeast to the final product? Hi! Rise time totally depends on the temperature in your kitchen. I would say a total of 1 to 2 hours from start to finish. It’s not too bad! I’ve definitely made it in a time crunch before and just turned my oven on low and set the sheet with the rising bread next to the oven so it’s a little warmer. I hope you give it a try! Thank you! I’ve tried no less than 20 times to make bread from scratch-no machine, no proofing oven etc… And have failed every time. 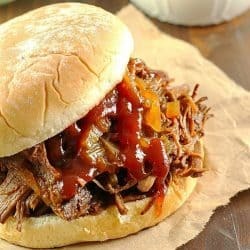 This recipe is straightforward and simple. And the results are fantastic. Thank you thank you for sharing this. I’m so happy with the way it turned out. Yay! I’m so happy you loved it Alison! It really is the best easy bread recipe! My husband and I have a running joke about my cooking…when I have a particularly spectacular result he calls it ‘hit-the-knee worthy’ (worth proposing again over). He was hitting a knee just from looking at it when I pulled the rounds out of the oven (and again after his first bite)! 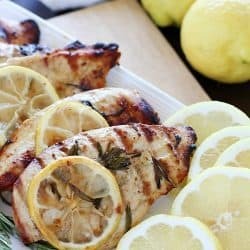 Amazing recipe, awesome texture and dangerously tasty even without the olive oil/balsamic vinegar! Woohoo!!! So happy it was ‘hit-the-knee worthy’!! Isn’t it so easy?! Just about the best bread recipe ever! Thanks for the comment! 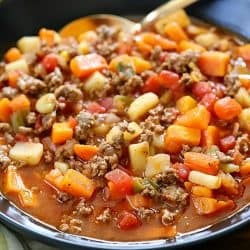 Just made this recipe and it is DELISH!! I did substitute the flour with whole wheat and it is perfect. 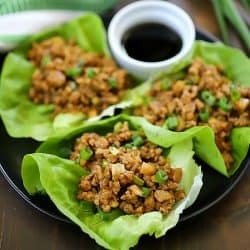 Simple, fast, and delicious. What more could you want! YAY!! I’m so happy you liked it! 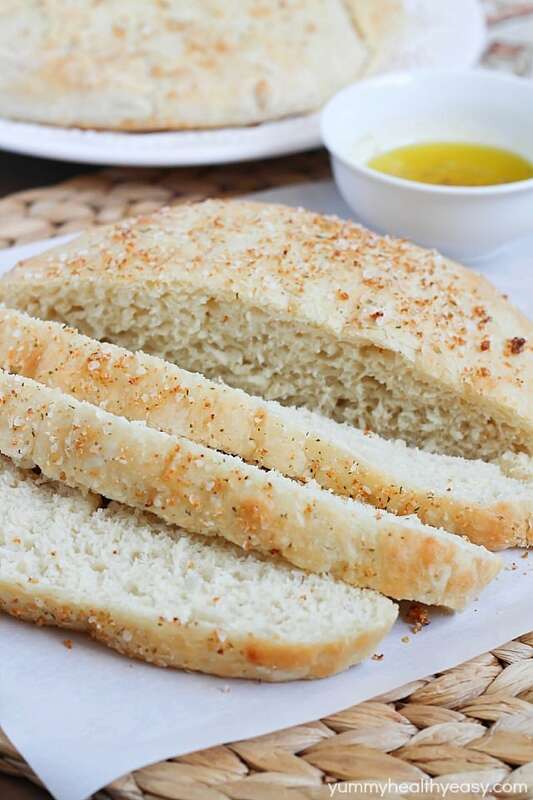 It’s the best and easiest bread ever! Made this last night and it was AMAZING! Everyone loved it and gobbled it right up. There was very little left over lol. I will definitely be making this again soon. I loved how easy it was to make. Yay!! I’m so happy you liked it! It’s so easy and so good! I haven’t tried it gluten-free yet! I’m a little intimidated by GF flour, lol! I’ll let you know if I try it, though. Thanks! I have been making this for a couple of months now. Even tried it with whole wheat flour. More dense, but still yummy. I think tonight I will make it as a base for Pizza. Thanks for this. We love it ! I’m so happy you like it! I have yet to try it with whole wheat flour, will try that next! Thanks for the comment! SO happy to hear that, Bailey! Thanks for commenting! It is seriously amazing, isn’t it?! And it is so so easy! I’m glad you like it! If I make dough and let it stay overnight in the fridge, would be too long?? I mean is it possible to prepare it a night before and bake for next day’s dinner? Or have to bake as soon as dough rise? You need to bake it as soon the dough rises. I don’t think it will turn out right if refrigerated. I hope this helps! Thanks for the comment! The dough can even be frozen and baked just before dinner time 😉 It will turn into a perfect bread! made this today, it is wonderful. The instructions were a little vague, but it all came out all right. So glad you liked it! I’m sorry you thought the instructions were vague. I tried my best to make it easy to understand. Maybe I should add step by step pictures or something. Hey im trying this out today. I have never made any kind of bread before so I have my fingers crossed with high hopes. I have had the bread in the bowel waiting for it to rise…. im not sure how much its suppost to rise after an hour of waiting I just split it and will wait a little while more before I place it in the oven Im a bit worried its not rising as much as it should. I have done exactly as you have said. How did it turn out, Kimberly?? Any questions? I hope you liked it! I have just prepared the recipe as follows, and it is in the oven on the cookie sheet to rise, (the oven is not on yet). Just wondering if it’s necessary to cover the dough while waiting for it to rise. It’s very sticky, also how long does it normally take to rise? Thanks so much! Hi Joe! I don’t cover it when it’s rising. The rising totally depends on how warm your kitchen is. 😉 You should be able to tell when it’s done rising, just about when each loaf is doubled in size. I hope this helps! Let me know if you have any other questions! I just ran to the store to pick up yeast. I am so making this tonight. Can’t wait. Thanks for sharing!!! I hope you love it as much as we do!! Let me know if you have any questions! I’ve made this twice now and it is AMAZING! So eady and SO tasty. I also just tried to make it with a gluten free flour blend (Namaste brand, which I’ve used for other baking with succeds) and it was like a brick. Perhaps others have had successes, but I have not. 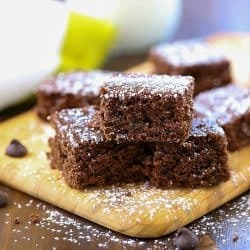 I’m a novice gluten free baker, so take my failure with a grain of salt. Trafitionl recipe as followed was a huge success! Thanks for the comment, Diane! I’m so thrilled you liked it! I’m also glad that you tried it with gluten free flour, I still want to give it a try and see if I can get it to turn out. Thanks again! 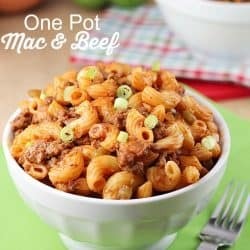 I made this for dinner tonight, and not only was it easy, it was a huge hit with my family of four! The kids dove in as if they were starving, and my husband commented on it at least twice. 🙂 I tried drizzling the top with olive oil and sprinkling with Nature’s Seasoning before baking, and it was fantastic. Thanks for sharing the recipe! I’ll be keeping this one. Isn’t it the best?! It’s always a hit! So happy you guys liked it!! I just made this bread and it was super sticky and expanded outwards instead of upwards on the baking sheet and ended up as flat as a pancake! Any idea what might have gone wrong? I am still a bread beginner, but I followed the recipe word for word! Hi Brenda! For the first rise, it stays in the bowl and is a bit wetter. It won’t form a ball on its own. When it’s doubled in size, take the sticky dough out of the bowl and split into two balls and let rise until doubled again. I hope this helps! Thanks a lot Jenn, will try this recipe for sure. It looks easy and yummy. But could you please give me the dip recipe. thanks! Hi there! I think my friend made the dip by roasting some garlic in olive oil over low heat. I never got the recipe from her, actually! Tkank you!I will make the bread. Hi Nancy! I usually use Active Dry Yeast Original. I hope that helps! I made this bread twice now and it has been AMAZING both times. Thank you so much for the recipe! I do have a question, would it be okay to bake these in bread pans? Or would that negatively effect it? (I’m new to baking bread). I’m not sure how this recipe would do in a bread pan! I’ve never tried it before. If you do try it, please let me know how it turns out! I made this tonight! Beautiful and yummy! 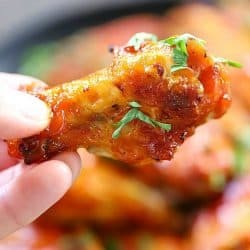 I am wondering if there are high altitude (7280 feet above sea level) adaptations for this recipe? Hi Carol! Unfortunately, I don’t have high altitude adaptations for the peasant bread. I’m sorry!! I live at a higher altitude. For most baking of breads, cakes, cookies; i add extra flour. I think a google search would help to know how much for any area.